Home ❯ News Items ❯ Have You Safely Packed the Kids? Have You Safely Packed the Kids? Saturday 30 December 2017: Researchers from Neuroscience Research Australia (NeuRA) are urging drivers to check child restraints are properly secured before travelling this holiday season. Car crashes remain a leading cause of death and disabling injuries among children, with over 370 lives lost this year on New South Wales roads. When packing the car, many drivers move fitted car seats for children and babies to load luggage, position camping gear, or sports equipment. During this time, it is possible that the child safety seat or capsule may be repositioned, the anchor points may be untethered, or the seatbelt may become twisted. While most children now use the proper restraint for their age, the number of errors in how child restraints are fitted or installed hasn’t improved. NeuRA Associate Professor, Julie Brown, highlighted these errors can greatly reduce the protection provided to children in a crash. “A correctly fitted child restraint which is appropriate for the child’s age and size can reduce the risk of serious injury or death in road crashes by up to 70%, said A/Prof Brown. A/Prof Brown also emphasised the importance of keeping an eye on how your children are interacting with the restraint during long journeys. “It is really important that children keep their arms within the harness of child safety seats and keep the seat belt positioned over their mid shoulder in booster seats,” said A/Prof Brown. Transurban Group General Manager, NSW, Kristine Cooney said the Transurban Road Safety Centre at NeuRA is committed to improving road safety for all motorists across Australia. 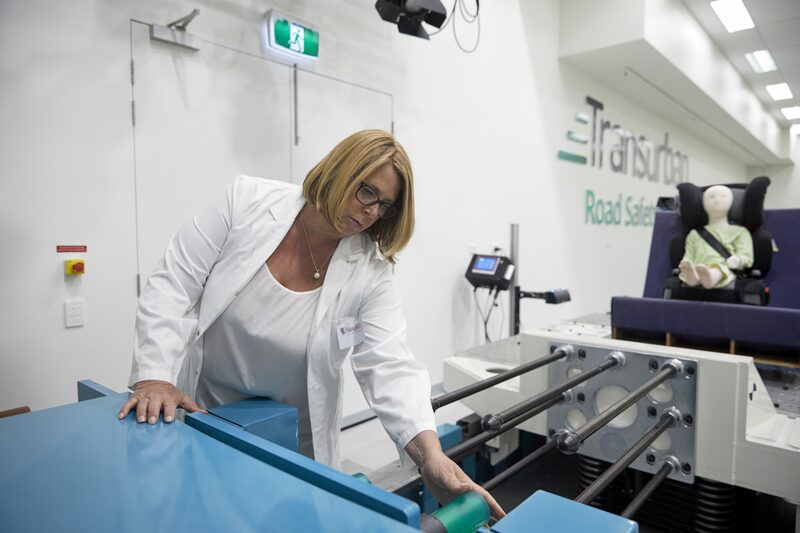 “Research into child restraints and ensuring they can be easily and correctly secured is pivotal to the work being done at the Transurban Road Safety Centre,” said Ms Cooney. A 2010 study found half of all restraints had errors in how they were used. Some had up to seven errors, ranging from failing to buckle the child in to slackness in the belts and sashes. Most often parents weren’t aware they had made a mistake. A properly-installed and fitted child restraint stops a child moving in a crash, by attaching them to the vehicle’s rigid structure. It ensures the force of an impact hits the strongest parts of the body more likely to recover, like bones, instead of internal organs and the brain which may never heal properly. When the child seat or restraint is installed, or a restraint is moved from one car to another. Errors caused by a child who may take an arm out of the restraint or fiddle with the sash.